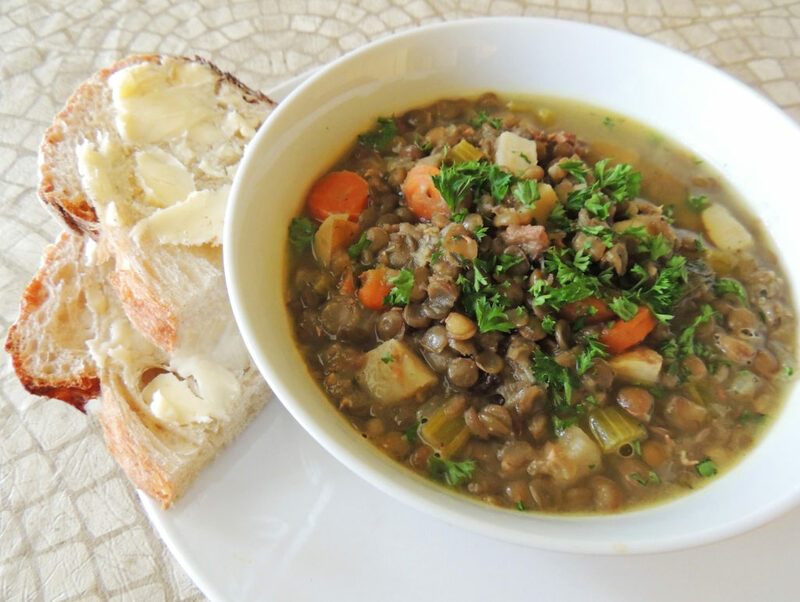 Not sure what to do with lentils? In addition to soups, lentils are wonderful in salads, and their dense, meaty texture makes them appropriate for vegetarian loaves. Try one of our recipes that feature French, brown, and red lentils. Place lentils in 4 cups of water and bring to a boil; cook for 25 minutes. Add 1/2 teaspoon seasalt during the last 10 minutes of cooking. Lentils should still be somewhat ï¬rm. Drain the lentils. While the lentils are cooking, bring quinoa and pinch of seasalt to a boil in 2/3 cup water; cover and simmer over low heat for 20 minutes. Allow to cool. In a large bowl, toss together the pepper, tomato, onions, and parsley. In a separate small bowl add the garlic, olive oil, vinegar, mustard, oregano, and cayenne and whisk thoroughly. When lentils and quinoa are cooled, add to the mixed vegetables. Pour dressing over the salad, add salt and pepper to taste, and stir gently. Serve over a bed of greens. While lentils are cooking, saute the onions, garlic and mushrooms in oil over medium heat until soft, about 10 minutes. In a large bowl, mix vegetables and herbs with tamari, bulgur and lentils until well combined. Press evenly into into prepared loaf pans, brush with optional ketchup, and bake at 350 degrees for 45 minutes. Let cool 10 minutes before slicing. Heat oil in a large soup pot over medium-high heat. Add the cumin seeds and mustard seeds. Cook for 1 minute, stirring constantly. Add remaining ingredients except for spinach. Bring to a boil, reduce heat and simmer for 30 minutes, stirring occasionally. Just before serving, add the spinach and cilantro, garnish with cilantro and your choice of additional options. In a large skillet, heat 2 tablespoons of olive oil over medium-low heat. Add the sliced onions and cook until deeply browned, about 20-30 minutes, stirring frequently. In a large saucepan, bring the broth to a boil. Add the lentils and return to a boil. Reduce to a simmer and cook, uncovered, for 20 minutes. Add the rice, half the cooked onions, cumin, and the vinegar. Season with salt and pepper. Bring to a boil, reduce heat to low, cover and cook for 22 – 25 minutes or until the rice is tender. Remove from heat and let rest, covered, for 10 minutes. Serve with remaining caramelized onion on top along with a dollop of yogurt and sprinkle of parsley. Heat olive oil in a large soup pot over medium heat. Add onion, carrot, celery, and yam and sauté for 8 minutes until vegetables begin to soften. Add garlic, ginger and spices and cook 2 more minutes. Add the vegetable stock, red lentils and tomatoes, bring to a boil, reduce heat, and simmer about 25 – 30 minutes until lentils are tender, stirring occasionally. Stir in beans and coconut milk. Cook another 10 minutes. Season to taste with salt and cayenne.